We began to walk through the low, gnarly heather that carpeted the open areas opposite the car park. A small party of New Forest ponies moved slowly ahead of us, faintly inquisitive but with a finely tuned sense of which humans might offer an apple core. The warm air was thick with the scent of heathland, a heady cocktail of heather, the faint honeyed-coconut traces of gorse, and pony dung. A tiny butterfly darted along the narrow winding path we followed, flashing fragments of electric blue before us. It settled briefly on a patch of damp soil, proboscis probing the ground for minerals, allowing us to see the distinctively spotted dove-grey underwings – the first silver-studded blue I had seen for years. My last had been in Dorset over a decade previously, on a hot afternoon that faded into a dusk punctuated by the dim light of glow-worms and the churring calls of nightjars. I would not have time to look for either insect or bird later that day, for I had an appointment the following day in East Anglia, but this small butterfly was a welcome sight. Jeff , with characteristic understatement, was pointing into the heather a short way ahead of us. There, growing through a knotted twist of heather wood, was a small, densely flowered white orchid. Beyond it, peeping through the heather, I could see more flowers still. They were, in the flesh, not the virginal white of photographs and field guides – these flowers had a creamy yellow cast, the colour of antique ivory chess pieces. Each individual orchid was a masterpiece of sculpture and form. Rising from two fat, oval, shiny green leaves, a flower spike held around sixteen individual blooms, spaced about the upper half of the stem, each one a miniature white angelic figure when viewed head- on. The long, green- tipped labellum formed the body between two spread white lateral sepal wings, while the upper sepal and the petals formed a cowl about the angel’s face. Behind each heavenly body extended a long, slightly down- curved spur – just like those of the tropical orchids that Charles Darwin had predicted would be pollinated by a moth with a suitably long proboscis, albeit these spurs were considerably shorter. 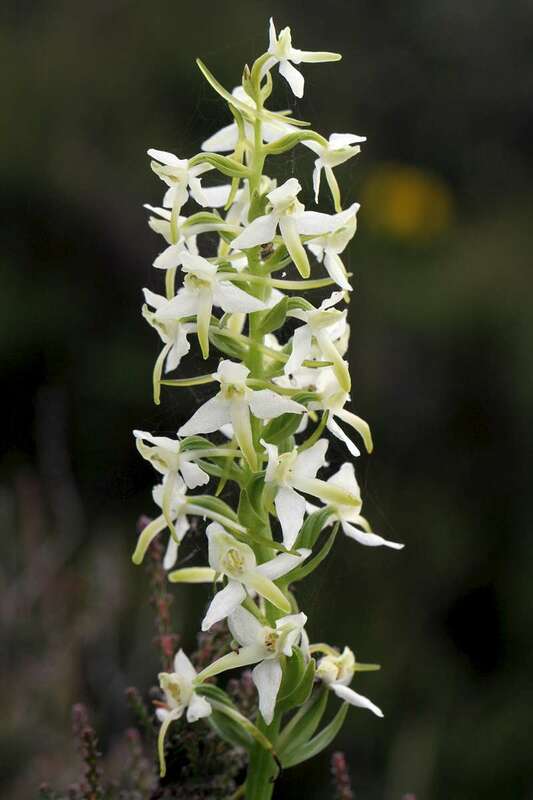 The lesser butterfly orchid spurs were long enough to exclude all but a select band of long- tongued pollinators from getting anywhere near the sweet nectar the spur contained.